Post updated 14 June 2016 - artwork previously assigned as being by Mike Lacey now attributed to Jimmy Hansen. There was no indication at the conclusion of the 76th Skateboard Squad episode, in Cheeky Weekly dated 12 May 1979, that it was to be the final outing for the trio under this title. 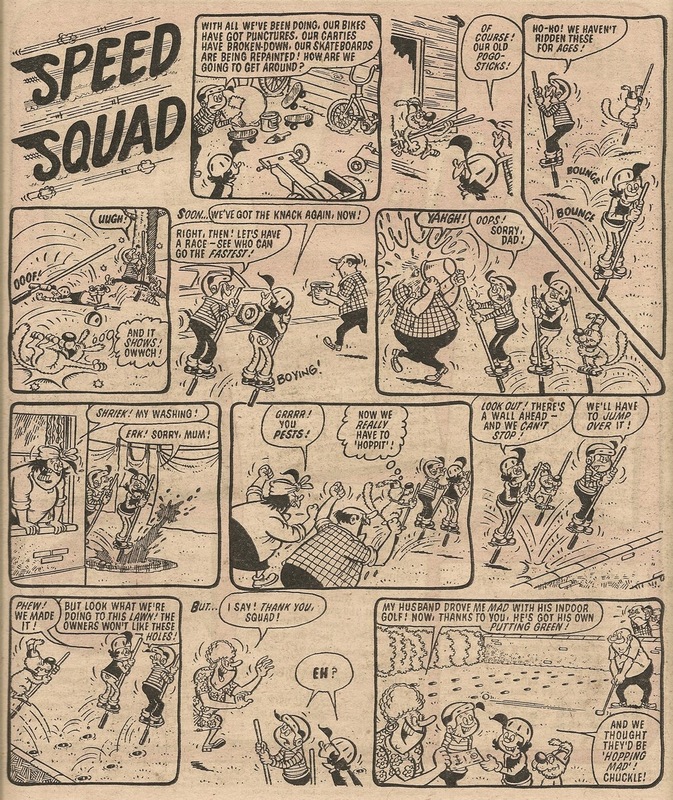 Squad members Skipper, Skatie and Wipe-Out were absent from the following issue (Cheeky's attempts to discover what was transpiring were repelled), but they reappeared in the 26 May 1979 comic, the first of what were to be 32 appearances in their new guise of Speed Squad. As the opening panel of the initial episode under the new title made clear, the terrific trio's mode of travel was no longer limited to the skateboard, although our heroes hadn't entirely abandoned their original conveyance of choice, as they used skateboards (on occasions motorised) regularly in the ensuing adventures. Despite these changes, the Squad continued to perform the righting-of-wrongs and general do-goodery that was evident in their earlier incarnation. Cheeky's introduction to the first Speed Squad strip can be seen here. The most exotic equipment at Speed Squad's disposal were the 'copter packs that featured in several of their escapades, although where they obtained such advanced (not to mention dangerous – ooh, I mentioned it) technology was never explained. It's unlikely that Skipper built them himself, as the flying machine he attempted to construct in the 26 January 1980 comic failed to leave the ground. Whereas Skateboard Squad featured several guest appearances by various Cheeky's Week characters, only two of Cheeky's pals crossed over into Speed Squad. Constable Chuckle was on hand to take into custody the miscreants who had been apprehended by the Squad in the 26 May, 16 June, 18 August and 24 November 1979 issues, and jovial journalist Rex Press (who had made his debut in Cheeky Weekly dated 29 September 1979) featured prominently in the 15 December 1979 adventure, although curiously he wasn't named. Dad was seen again, seemingly having abandoned his wig and glasses, along with a rather different Mum, in Speed Squad dated 25 August 1979. ... and Colin Whittock drew the Squad's 10 November and 01 December 1979 adventures (the latter featuring a mum based on Jimmy Hansen's revised design). The introductory Speed Squad episode covered a page-and-a-half, and barring the Rex Press adventure above which was just over a half-page, all the rest were single-pagers. ...a good try, but in the ensuing tale the Squad were travelling by go-cart. 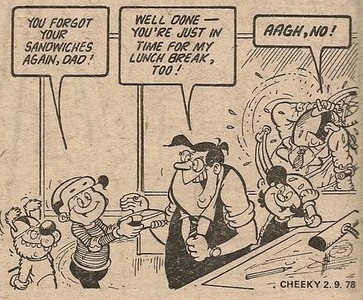 The intrepid trio's next visit to Cheeky's Week occurred in the comic dated 22 December 1979, one of the issues that was constructed from elements prepared for the aborted Christmas 1978 comics. 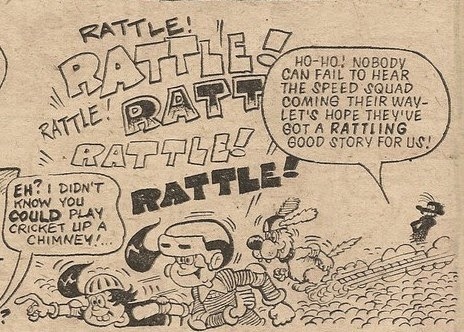 Since the Thursday page in question had been drawn months before the team evolved into Speed Squad, the terrific trio were depicted on their skateboards in the intro panel (although the wording of Cheeky's speech balloon was altered to refer to them by their new name). 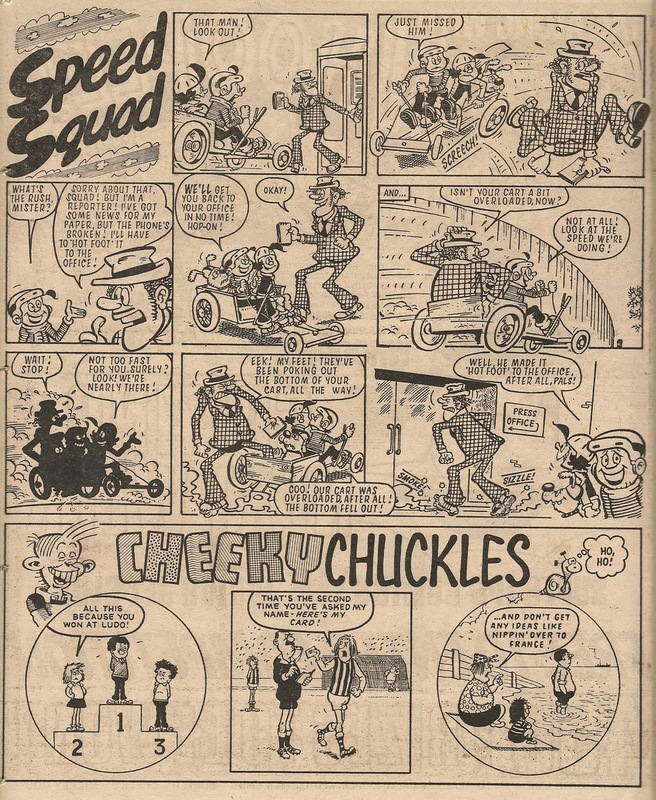 However, Speed Squad in that issue, in which our brisk buddies were variously travelling by bike, go-cart and skateboard, appeared after the Friday element of Cheeky's Week so given the 24 hour gap between appearances, the differing methods of travel weren't incongruous. 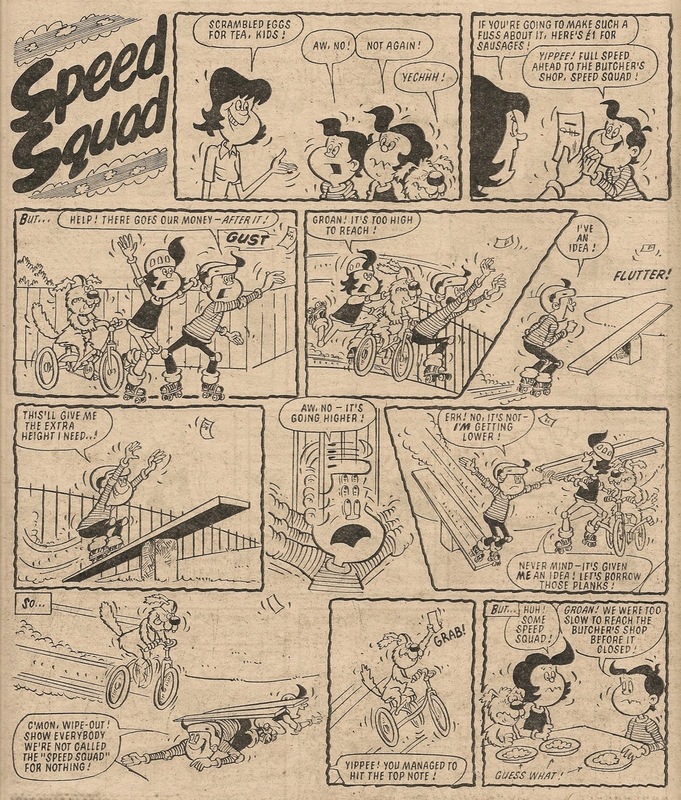 The final Cheeky's Week crossover for Speed Squad came a week later when, in another comic compiled from elements created over a year earlier, the team were seen again on their skateboards. Since a Speed Squad strip was absent from this issue no continuity error resulted. 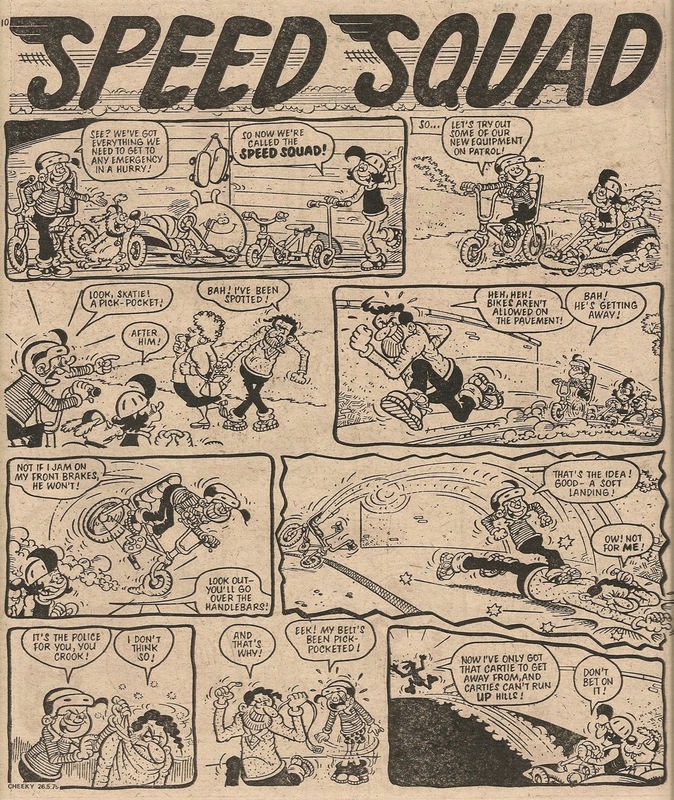 In Cheeky Summer Special 1979, the publication of which coincided very closely with the debut of the team under their new name (the Special was first advertised in Cheeky Weekly dated 23 June that year), the Speed Squad adventure saw them on skateboards and I suspect the strip was actually produced as a Skateboard Squad story but the title was changed near to publication date to tie in with their relaunch in the weekly comic. 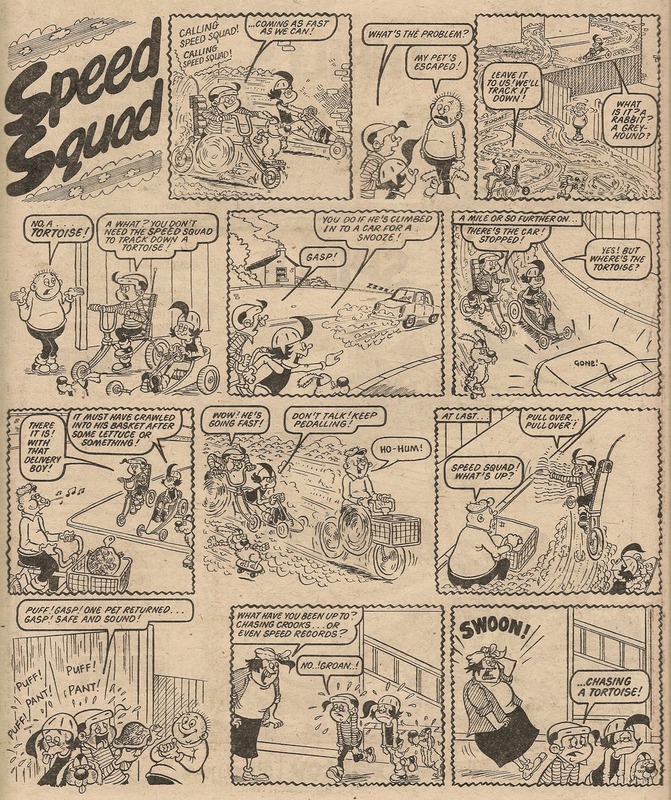 There were 2 Speed Squad strips in Cheeky Annual 1980 (on sale in autumn 1979), and a colour outing for the team in Cheeky Holiday Special 1980. 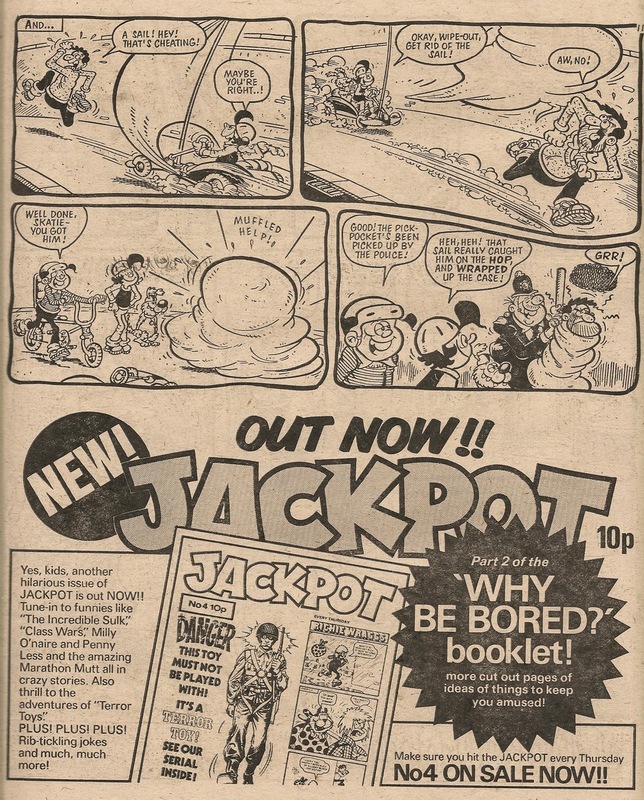 2 Speed Squad stories, plus a Speed Squad Grand Prix Game in the 1981 Cheeky Annual were followed by a 2-page adventure in Cheeky Summer Special 1981. Speed Squad had a single adventure in Cheeky Annual 1982, but they failed to appear in Cheeky Summer Special 1982 (the final Cheeky Special). The indefatigable trio were back in Cheeky Annual 1983 and their final annual outing was in Cheeky Annual 1984 and thus they were absent from the toothy funster's concluding yearly offering in 1985.